Sermons on Repentance look at the forgotten message of repentance. 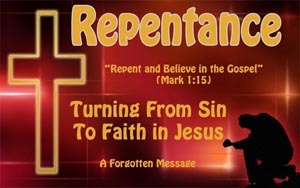 Biblical repentance is turning from sin to faith in Jesus Christ as the way, the truth and the life. "The time is fulfilled, and the kingdom of God is at hand. Repent, and believe in the gospel" (NKJV Mark 1:15). "One of the most fundamental marks of true repentance is a disposition to see our sins as God sees them" (Charles Simeon). How Do I Become A Christian? Repentance! In Mk 1:15, Jesus said, "The time is fulfilled, and the kingdom of God is at hand. Repent, and believe in the gospel." Jesus said there are two things a person must do to belong to the kingdom of God. REPENT AND BELIEVE in the gospel, that is, "That Christ died for our sins according to the Scriptures, and that He was buried, and that He rose again the third day according to the Scriptures" (1 Cor 15:3-4). The content of genuine repentance consists of a change of mind, a change of feelings, and a change of direction resulting in a change in lifestyle and conduct. A Sunday School teacher once asked a class what was meant by the word "repentance." A little boy put up his hand and said, "It is being sorry for your sins." A little girl also raised her hand and said, "It is being sorry enough to quit" (Author Unknown). Another writer made this observation, "True repentance is frankly a foreign concept to many churches today. What has happen? Why is it that the fear of God is no longer regarded as essential and central to true Christian living? We have made God small and man great...Martin Luther put his finger on the issue long ago when he told the great humanist scholar Erasmus, "Your God is too manlike" (Author Unknown). Therefore, there is a desperate need to look at what is repentance. In the New Testament, it always speaks of a change of purpose in life, and specifically a turning from sin. Jesus viewed repentance as a forsaking of the old life (ie, a life of sin) and a turning to God for salvation. "...Repent, and believe in the gospel" (Mk 1:15). For example, Zacchaeus in the presence of the Lord repented and his life was changed, this was evidenced by his willingness to give restitution (Lk 19:8-9a). He had turned from sin to God. Paul had the same in mind (ie, a change of purpose) when he described the repentance of the Thessalonians. "For they themselves report about us what kind of reception we had with you, and how YOU turned to God from idols to serve a living and true God" (1 Thess 1:9). Note the three elements of repentance. They turned to God. They turned from evil. They began to serve God. B. Repentance is not merely being ashamed or sorrow over sin. Though genuine repentance will involve an element of deep remorse. BUT it is more than remorse. It is a redirection of the human will. It is a purposeful decision to forsake all unrighteousness. It is a pursuit of righteousness. C. Repentance is not merely a human work. It is a sovereignly bestowed gift from God. For example, Cornelius's conversion. "When they heard these things they became silent; and they glorified God, saying, 'Then God has also granted to the Gentiles repentance to life'" (Acts 11:18). Paul wrote to Timothy that he should gently correct those who oppose the truth, "if perhaps God may grant them repentance leading to the knowledge of truth" (2 Tim 2:25). The intellect, that is, a change of mind. The emotions, that is, a change of feeling. The will, that is, a change of direction. E. We need to examine these three concepts in depth. Intellectually! Repentance begins with a recognition of sin. Understanding we are sinners. Understanding our sin is an offense to a holy God. For example, the tax collector in Lk 18:13. Repentance must also include a recognition of who Christ is. Understanding His right to govern one’s life. Emotionally! Repentance is often accompanied by an overwhelming sense of sorrow. This sorrow in and of itself is not repentance. Someone can be sorry and ashamed without being truly repentant. For example, Judas felt remorse, but he was not repentant (Matt 27:3-5).The rich young ruler went away sorrowful, but he was not repentant (Matt 19:22). Neither turned from their sin to God. Repentance (ie, genuine repentance) does include an element of sorrow (2 Cor 7:9-10). Not sorrow for getting caught. Not sadness because of the consequences. But a sense of anguish at having sinned against God. Volitionally! Repentance involves a change of direction or purpose. This involves certain things. Jesus must come first (Mk 8:34-38). Jesus comes before our will "...Let him deny himself..." Jesus comes before our ambitions "For what will it profit a man if he gains the whole world, and loses his own soul" (v. 37). Repentance will result in a change of behavior and this is called the fruit of repentance. A. A sincere change in one’s lifestyle. The tax collector asked John the Baptist this question, his answer to them was, "Collect no more than what you have been ordered to" (Lk 3:10). The soldiers asked the same question, and he said, "Do not take any money from anyone by force, or accuse anyone falsely and be content with your wages" (Lk 3:14). Those who have genuinely repented will stop doing evil and begin to live righteously. B. A sincere change in one’s conduct. Charles Spurgeon wrote: "If the man does not live differently from what he did before, both at home and abroad, his repentance needs to be repented of, and his conversion is a fiction. Not only actions and language, but spirit and temper must be changed... abiding under the power of any known sin is a mark of being the servant of sin..."
The western church has subtly changed the thrust of the gospel. Instead of exhorting sinners to repent, evangelicalism in our society asks the unsaved to 'accept Christ.' That makes a sinner sovereign and puts Christ at their disposal. Jesus said, "...Repent and believe in the gospel" (Mk 1:15). Therefore, we need to repent and throw ourselves on the mercy of God. This sermon on repentance is part of a series of sermons that I put together to explain the foundations to Christianity. You can check out the rest of the sermons by clicking on Christian Foundations.